High government leaders aren't generally known for flaunting their errors. But toward the end of his life, former Defense Secretary Robert McNamara issued a string of candid mea culpas for misjudgments about Vietnam that were made during his 1961-68 tenure at the Pentagon, especially his delay in acting on growing doubts that the war could be won. "I'm very sorry that in the process of accomplishing things, I've made errors," McNamara said in Fog of War, an Oscar-winning 2003 documentary. 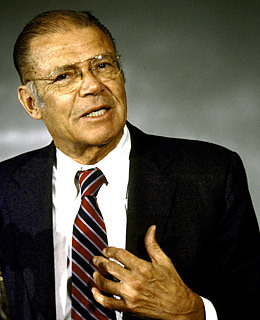 While he never issued a formal apology for his role in the quagmire, McNamara, who died in July 2009 at age 93, made clear he was haunted by the blunders made under his watch that cost the lives of thousands of U.S. troops. "People don't want to admit they made mistakes," he explained to the New York Times. "This is true of the Catholic Church, it's true of companies, it's true of nongovernmental organizations and it's certainly true of political bodies." Download the TIME BlackBerry App at app.time.com.